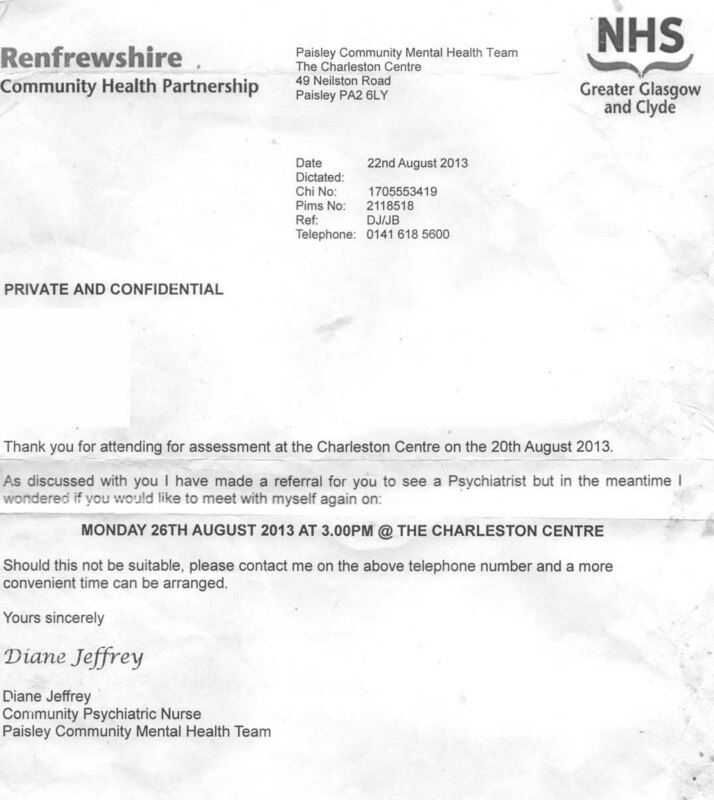 The purpose of this website is to publish all the correspondence between myself and Renfrewshire CHP Mental Health. After a certain point it was deliberate entrapment to reveal the gross inadequacies of the complaints process and those involved. This is a repeat of how my (medical) family made a successful complaint to the GMC about an alcoholic GP who refused to make a visit when my sister in law had a miscarriage. Having had no honest engagement from anyone, the website has been revamped with photographs of the perpetrators and other touches of ridicule. 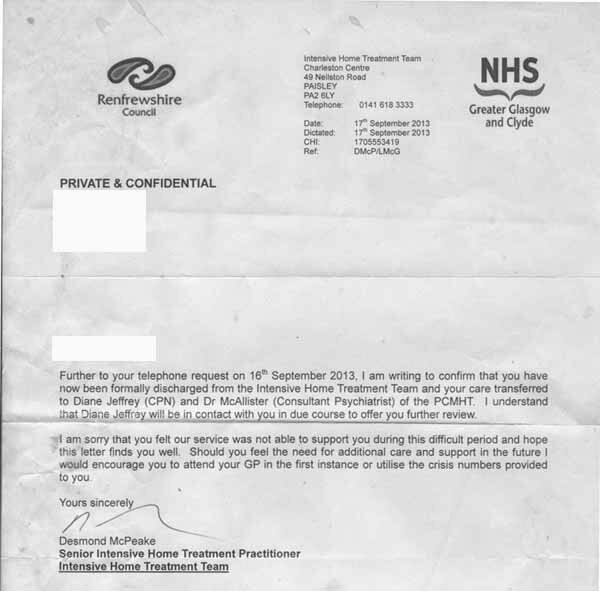 Despite having asked a GP to discuss a long term (assumed to be stress related) exhaustion issue with a psychiatrist (because I thought there might be a medical cause) and never having been diagnosed with a mental health problem, I was subjected to a catalogue of pre-meditated, orchestrated bullying at the IHTT * in Paisley. This letter tells me they were attempting to treat me for anxiety. It says "the treatment offered, in this case Olanzapine, which can be appropriately prescribed for anxiety. " I had previously been offered Valium (Diazepam). I had minimal anxiety at that time. within 4 hours of referral to the service"
"If we are best placed to support you, we will arrange an emergency assessment that day. This could be at the Charleston Centre, Dykebar Hospital or the accident and emergency department at the Royal Alexandra Hospital". Something is already very wrong here, that's before I even met them. How could such unbelievable slackness, incompetence or corruption have happened ? The suspicion must be that they were short of customers and someone's tried to pull a fast one by taking me from the GP referral list. I wrote a letter to head of the unit, Kevin Hernon. He ignored my letter so I looked him up online and quickly discovered he was a nurse and his Facebook page. Here are a couple of revealing photos. Kevin supports Glasgow Celtic football team. 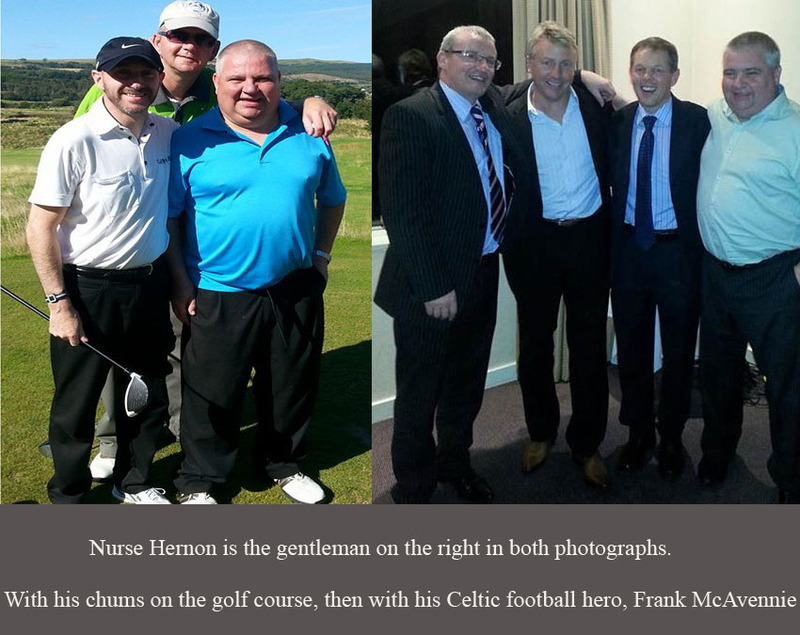 The second photo shows him with one of his pals and two of his Celtic football heroes. 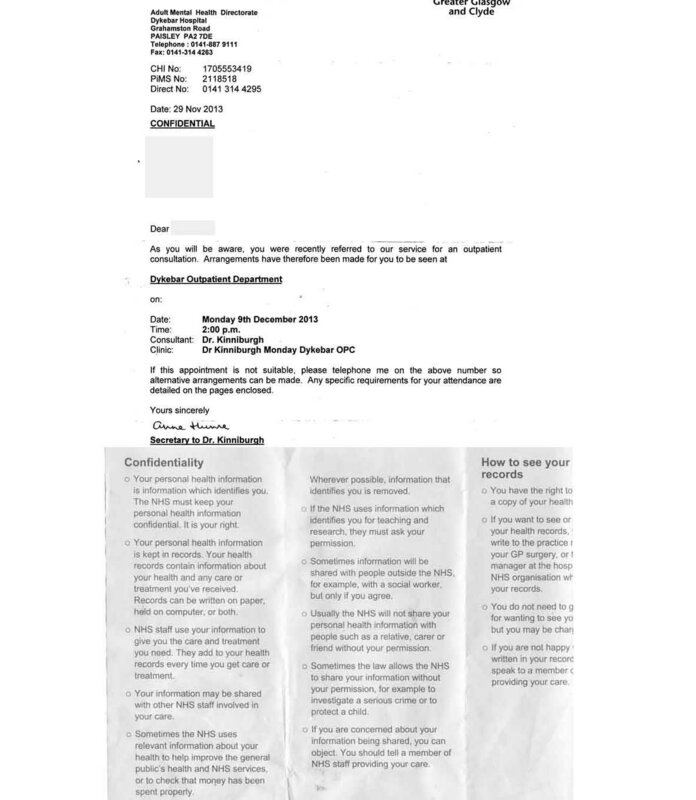 More seriously, a contemptible, transparent and infantile subterfuge was arranged to give me a psychiatric assessment after I had complained to the GMC about a psychiatrist, despite me being discharged two months earlier with not only no diagnosis but no comment on the state of my mental health. 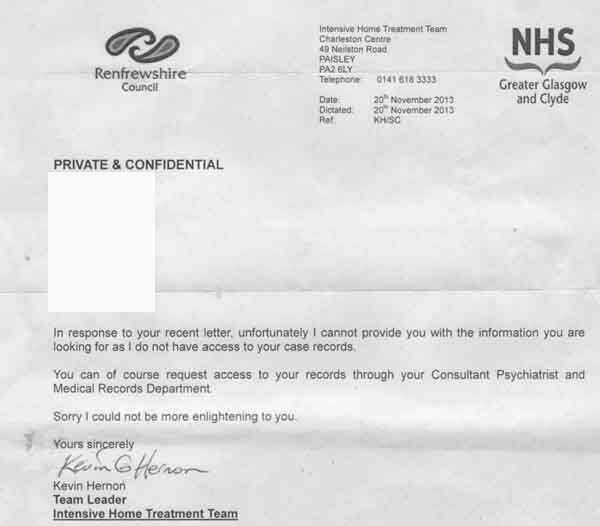 It was done by sending me a letter apparently with an appointment to see my medical records (enclosed leaflet below letter) , but was actually for a psychiatric assessment. I saw through it instantly because the letter simply didn't mention medical records. Here is a later letter with a full confession from the psychiatrist I was supposed to see. This is a vile tactic used by NHS management against whistle blowers. The medical records scenario came about because team leader, Kevin Hernon refused to give me information I requested and told me I would have see my medical records. 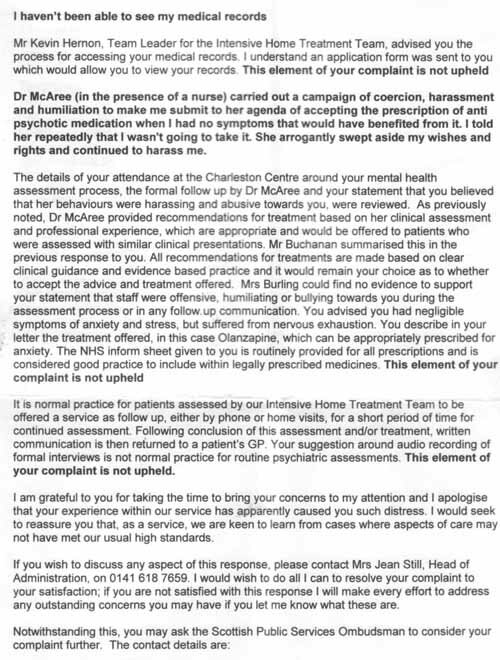 The best evidence for the abuse is a letter and I sent to a Dr McAree asking for details of the drug treatment she wanted to offer and the evasive, inept and fear mongering reply. I deliberately asked for details which she was unable to produce, revealing there were no valid medical grounds for prescribing a drug. I contacted the drug licensing authority who told me that the drug (Olanzapine) she wanted to prescribe was not licensed for anxiety and that I should complain to the GMC which I did. The idea of this page is that it should be a complete summary of events. My name has been redacted from correspondence. I do not believe that anything that happened was unique to me. They would have done the same to anyone which is horrifying. 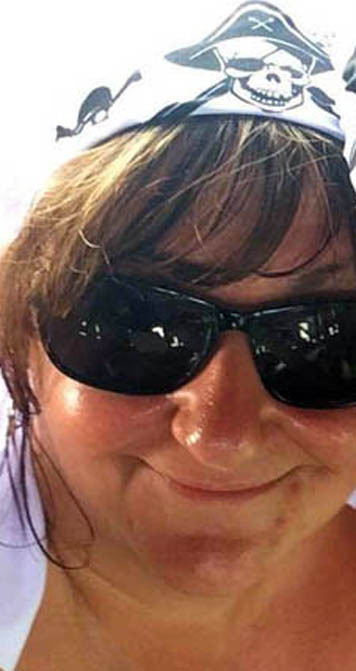 For completeness below is the head of mental health for 175,000 adults, Nurse Katrina Phillips. Appropriately attired. Retrieved from her Facebook page which I accessed when she was a user of my public Facebook page. I recognised the name. Management did not address one single question I put to them in an honest way. Dealing with them was like dealing with children. Below is psychiatrist Mark McAllister. Mark is the Glasgow Celtic supporter in the right foreground of this photo which appears to have been taken abroad with his 'bro'. The issue that caused me to stop the interview was him claiming that I was 'elated' which I absolutely wasn't, nor have I ever been without an appropriate stimulus. Even the most ignorant of football hooligans knows what the word 'elated' means. It's the feeling you get when your team scores a goal. If I had mental health issues of that nature (spontaneous elation) my high powered family, friends or colleagues would certainly have told me. All of them educated adults, none of them sectarian football supporters. This was a living hell for me until I spoke to the senior partner of my GP practice, Dr Slaven a responsible adult with a traditional university education from a traditionally educated family. Renfrewshire CHP mental health don't have anyone remotely like that. She was able to confirm that while I exhibited some anxiety, I was certainly not elated. From my GP medical records. agreed that he was distressed. He appeared irritable but not elated". 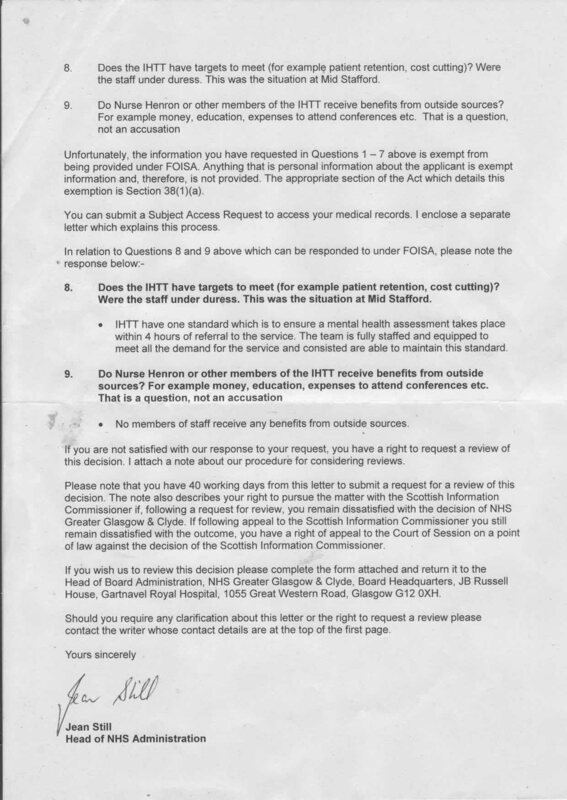 These questions were put to Renfrewshire CHP management in order to reveal that they appear to be running a scam to take patients from the GP referral list and making long term customers by using the IHTT (a four hour response team) to bully them into taking drugs. The situation has a distinct resemblance to other recent NHS management horror stories such as Stafford, Furness, Stratheden, Ayrshire and Arran, Glan Clwyd, Ellen’s Glen Portsmouth . 1. Who originally assigned me to the IHTT and why ? My GP doesn't know and can't understand it. I asked to see a psychiatrist to discuss exhaustion. If you claim it was based on the GP's report, I want to see a copy of it. How could I end up at a crisis unit (with a 4 hour response remit) 8 weeks after my GP appointment ? 2. What was the name of the nurse who witnessed Dr McAree's abusive behaviour on Friday 13th September, 2013. It was a male nurse of about 30. You don't have to look at records. there can't be many staff who fit that description. It is the first thing asked for on the GMC website. Nurse Henron refused to tell me and wrote I'd have to see my medical records. I will still complain to the GMC regardless and suggest that in my opinion the staff were behaving under duress because they all used exactly the same language. 4. Why did Mark McAllister arrange a scan (at the RAH) for me ? 5. Why did Mark McAllister make an appointment for me at Dykebar hospital for a psychiatric assessment with Alistair Kinniburgh (just after he discovered I had complained to the GMC about him) ? I want to see a copy of the appointment. This is the letter I received. My family and I are determined to expose who was responsible for that letter. Were others involved ? For example, Nurse Hernon ? Who gave him the medical records leaflet ? Was it Jean Still ? Anne Gallacher told me she had passed on my request to her. Confession in this letter . 6. 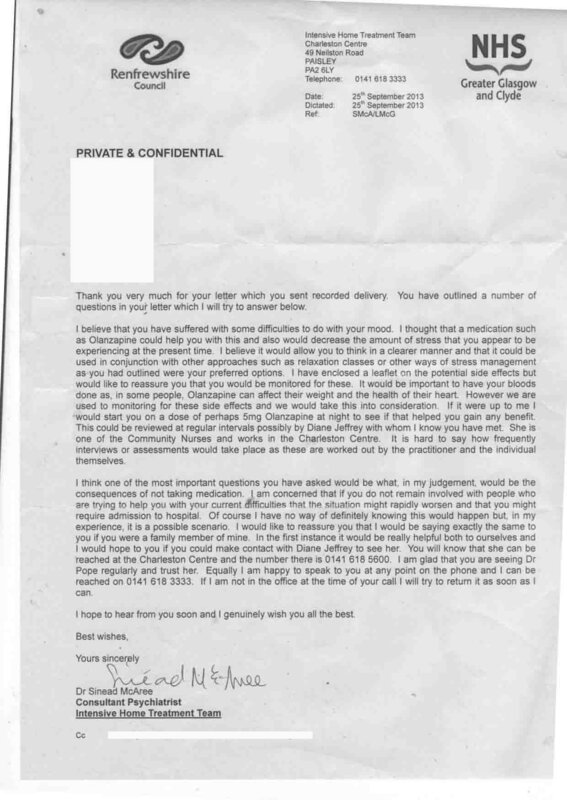 Alistair Kinniburgh told me in the same letter that Mark McAllister thought I had a mental health problem ? What mental health problem ? Please provide dated documentation that McAllister recorded that. 7. Does the IHTT have targets to meet (for example patient retention, cost cutting) ? Were the staff under duress to behave in a particular way. This was the situation at Mid Stafford. 8. Why did Nurse Buchanan suggest to a GP at my practice that I had complained about two doctors and they now thought was unwell and might need to be detained. It is in my medical records. This was 4/5 months after I had been discharged with neither diagnosis nor comment about my condition. This is a record of the abusive behaviour of the staff. Day 1. I had an interview with an obnoxious, insulting, pernicious psychiatrist by the name of Mark McAllister. I was preposterously told I appeared 'elated' when I was actually dumbfounded, disgusted and annoyed. I assume to claim I was bipolar. I stopped him before he got a chance. An emotional reaction characterized by euphoria, excitement, extreme joyfulness, optimism, and self-satisfaction. A GP in my practice who knew him at university confirmed he had the same 'personality issues' then. A look of silent horror is the universal response to the mention of his name. He repeatedly asked me "do you think you're attractive to women" after I told him I had no confidence with women. Day 3. Nurse Dock and an older woman. The interview became a hostile interrogation when I said I refused to see Mark McAllister again. It was threatened (by Nurse Dock) that said psychiatrist will come to my house if I didn't attend next day. That traumatised me and made me angry. I said I would phone the police if he came anywhere near my house. Day 4. Insulted and abused again, this time by a female psychiatrist and nurse. Put under enormous pressure to take another drug, an anti-psychotic, again for anxiety. I refused a large number of times. I sent a letter (closely based on Mind guidelines) asking for details of treatment, emphasising the multiple refusals. Her reply was evasive, oppressive, deceitful, threatening and inept. She didn't address the questions to remotely near a professional standard. I expected something horrible to be honest, but that was shocking. My letter and her reply (described above). 'Could I ever be forced to take medication? In most cases: no. If you're offered medication, you usually have the right to refuse it and to ask for an alternative treatment'. At times I felt I was pushed drugs upon, some psychiatrists didn't ask me or even discuss with me whether or not I wanted the medication, usually I was told to take it and told how it would help me, without being aware of the serious side effects of the drugs. I feel strongly it should be someone's decision what they put in their body and everyone has a right to be warned of the risks before taking the drugs not after they've developed it. The whole thing can be summed up rather easily with comparisons to other experiences I had around the same time. I had very recently been interviewed by a highly intelligent, perceptive and capable psychologist / psychiatrist at ATOS. She was a vastly superior individual to everyone at the IHTT. I went to Specsavers, the optician and other staff were intelligent, responsive, human, warm, humorous and professional. The IHTT rude, abusive and creepy. I twisted my ankle in the street, four (what appeared to be) junkies helped me up. They were concerned, supportive, friendly, very motivated to get me up and walking again. They couldn't have done more. Again the exact opposite of the IHTT. I met them walking to the town and had a conversation. They were nice people. I can't imagine having a conversation with any member of the IHTT. Everything that happened to me was well below any imaginable minimum standard. How did it come about that all these thoroughly unpleasant people came to be working in the same place ? Everyone behaved in extreme ways to bully into taking drugs. That it is consistent with the behaviour being orchestrated and the staff being under duress. The most plausible explanation is by management. When I asked team leader Nurse Hernon for the names of the abusers to allow me to make a complaint, my first letter was completely ignored. When I threatened to tell a CHP board member, I received a very cheeky response, telling me I would have to see my medical records. On reflection, my letter to him may have seemed cheeky, but there was such a vast difference between Specsavers and the IHTT, it certainly wasn't intended to be. They invited me to talk to them at a mental hospital (only after they saw part of my CV). I refused as they had behaved despicably and I wanted their incompetence and abuse in writing. That included being accused of having an unspecified mood disorder by someone who clearly didn't understand what a mood disorder was (Nurse Buchanan) or even understand the concept of a generic name. I see that as scandalous, their sense of entitlement means they probably don't. It has caused me a lot of distress as three GPs have witnessed. I tried to forget the whole thing, but the issue of the attempt to get me to a mental hospital under false pretences has wider implications. It isn't just done to mental health patients and the elderly, it's also done to NHS whistle blowers either as as form of retribution or an attempt to discredit them. For example here. The reason this website has taken so long is this deliberate misdirection and the dispiriting inadequacy of the response. 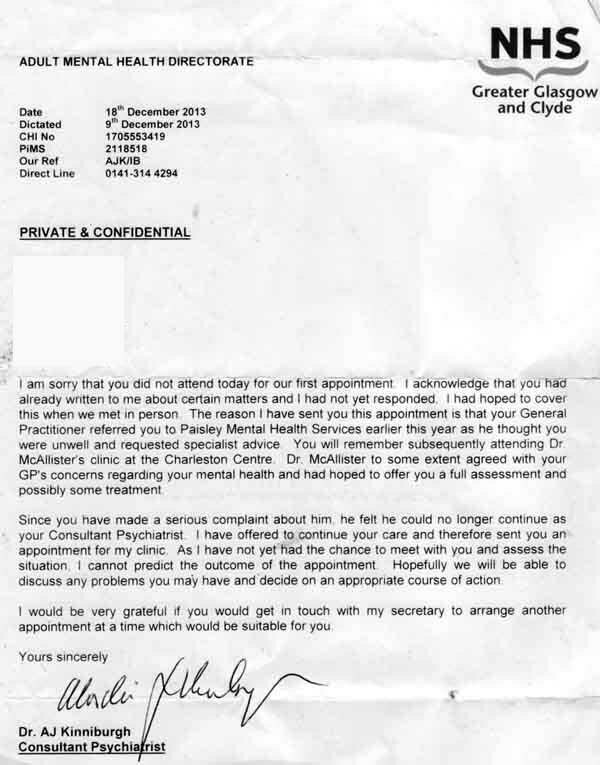 I don't believe Renfrewshire CHP Mental Health are willing or able to deal with complaints. I'm obviously not the only one with a similar experience in the NHS. BBC - The NHS still has a long way to go to improve the way it handles complaints. BBC-The failure to protect whistleblowers remains a "stain" on the reputation of the NHS in England, MPs have said. "The treatment of whistleblowers is a stain on the reputation of the NHS and has led to unwarranted, inexcusable pain for the courageous individuals affected," it says. "Please help & do something with the NHS complaints process, It causes so much misery for families." I am also doing this for people more vulnerable and compliant than myself. What happened to me is an exemplar of exactly how not to treat patients and exactly how not to deal with complaints. We simply can't have human beings press ganged into taking harmful drugs by the malicious misdiagnosis of psychiatric conditions. I am very happy to discuss this with any impartial individual. I have already spoken to a number of agencies in person and by telephone. 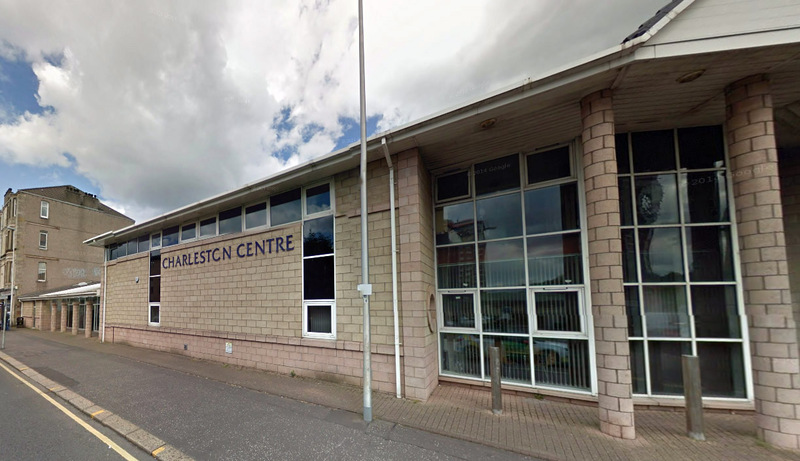 The website is split into the record of the abuse, the handling of the complaint, details of meetings with the two psychiatrists Dr McAllister and Dr McAree. Ancillary pages that are linked from elsewhere on the site. I want to thank IHTT nurse Diane Jeffrey, Anne Gallagher (CHP director's secretary) and Charleston Centre receptionist Caroline for their warmth and humanity, in contrast to the cold, cynical abuse of the IHTT. An important fact is that I had warm and friendly conversations with IHTT employee, Nurse Diane Jeffrey when I bumped into her, even during the abusive days. That extreme contrast in behaviour made the callous abuse crystal clear. This website is subject to continual improvements in its language / text . Thank you for reading.